In the past few years, more and more travelers seek out farm-to-table restaurants when booking green resort stays. When my family and I travel, we like to try local cuisine whenever possible. Not only is food grown locally eco-friendly, it also enhances our understanding of a place and its agricultural roots. Now it is easier to eat locally while on vacation. Check out these U.S. resorts with farm-to-table restaurants. Brasada’s ‘farm to fork’ Range Restaurant overlooks the Oregon high desert and Brasada’s stables and ponds. Brasada Ranch outdoor seating on the wide deck offers amazing sunset views. The restaurant works with nearly 20 local foragers, purveyors, and farmers to bring you dishes like buffalo carpaccio, oregon lamb osso bucco, and elk tenderloin. If you’re chilly sitting outdoors, don’t worry: warm blankets are brought to you table side, and a huge communal fire pit beckons. In winter, Range’s fireplace warms you as the snow falls outside. Even the kids’ menu items at Range are innovative and large-portioned. While not dining, there’s plenty of things to do for families at Brasada. 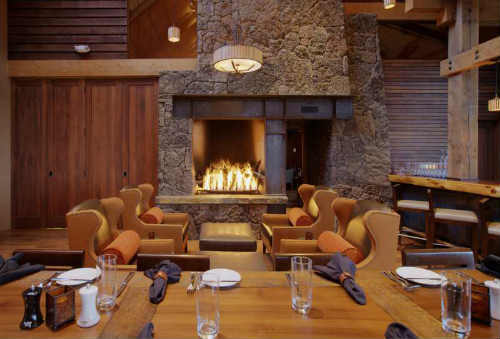 Located in the Canyons’ Resort Village, The Farm is an award-winning restaurant serving up mountain cuisine. Adults will find an impressive wine cellar. Appetizers and entrees are created with local, all-natural ingredients. 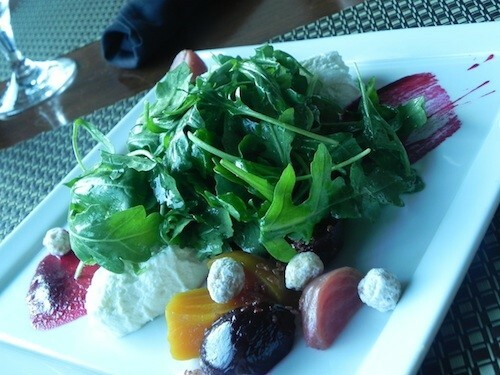 The menu includes delicious local specialties like rocky mountain lamb, roasted beets, and Grass Valley steelhead. Best of all, the food at The Farm is not just healthy, but rich and filling, too. It is just what you need after a day on the ski slopes or hiking in the mountains. Austin, Texas is known for their exciting cuisine, and Lakeway doesn’t disappoint. Every Wednesday, Lakeway’s Travis Dining Room offers a full farm-to-table menu for only $25 per person. 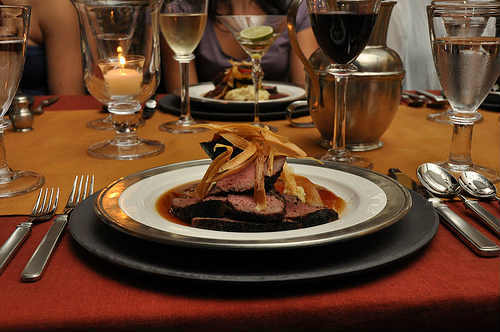 The meal includes starter, entree, and dessert, and features produce such as locally grown parsnip soup, grilled wild boar, and local greens. Before dining, Lakeway’s Back Porch offers complimentary beer, wine, and soda as well as light appetizers for resort guests. It’s worth lingering here before heading into the dining room. No matter where you eat at Stowe Mountain Lodge, the food will be farm-fresh, thanks to the resort’s dedication to farm-to-table dining and Vermont’s abundance of local farms and dairies. Named the Best of New England for their dining options, Stowe offers casual dining as well as elegant meals in Solstice, a four-diamond restaurant serving breakfast and dinner. Offerings include Vermont artisan cheeses, truffled beef pot roast, and sautéed seasonal vegetables. Bring the family, as Stowe Mountain Lodge offers innovative dining for little ones, as well as area hiking, skiing, and spa treatments. Paws Up offers a luxury Montana ranch experience that extends to their farm-to-table dining in the aptly named Pomp fine dining restaurant. In true local-food style, the menu at Pomp changes with the seasons. However, diners can always expect meat from local ranches, local greens and produce, and freshly caught Montana fish. For a more casual meal, book an evening with Paws Up’s chuck wagon. When not sampling the Western-style Montana cuisine, guests at the ranch relax in luxury, camping style, surrounded by the outdoors. If you find yourself in the Twin Cities, check out these sustainable restaurants in Minneapolis – St. Paul. Do you know hotels or resorts with fabulous farm-to-table restaurants? It is worth the effort to use a sustainable dining guide for sustainable seafood and local cuisine while you travel. Lanzarote is known for the quality of its food, and it’s easy to see why. The destination is home to the Canary Islands’ best wineries, with delicious vegetables grown in volcanic soil, tasty goat cheese and a plentiful bounty of fresh seafood direct from its numerous small fishing harbors. All of this is served up in restaurants in Lanzarote across the island. Prepare yourself for teeming plates and good value grub with our guide to where to eat in Lanzarote. When this British-owned burger joint opened in 2014, it injected a much-needed gourmet jolt into central Arrecife. It serves burgers (from €5), but these are organic, gluten-free burgers topped with homemade sauce. Don’t fancy a burger? Try Tabla’s salmon instead. It’s smoked in town, and it comes with tangy gherkins and capers. No matter what, you must order the Parmesan fries. Simple and friendly, this is authentic Canarian dining at its best. You will enjoy your meal seated on plastic chairs at plastic tables overlooking the beach in Arrieta. Order the lapas (limpets) with mojo sauce, prawns sizzling in garlic oil, and majorero cheese produced just up the road in Uga. There’s plenty of local wine on the menu too. Enjoy your meal with a bottle of crisp Lanzarote malvasia, a local white wine also produced in the Baleric Islands. While you are deciding between restaurants in Lanzarote, be sure to visit El Mirador. Overlooking Playa Blanca’s marina, this glass-fronted restaurant has uninterrupted sea views and a bulging Mediterranean menu. Stick to the local seafood for the best dishes. Order the tapas sizes for variety, perhaps the grilled red prawns, scallop skewers and octopus with paprika (from €9.25 each). It’s open midday until 10 pm, seven days a week, so there’s plenty of time to get a table. Most seaside Canarian towns have a cofradia (fishermens’ cooperative) and these serve the freshest fish. You should always order the fish of the day. We recommend asking for it cooked a la espalda (butterfly cut and grilled on its back). The cofradia in Playa Blanca is particularly worth seeking out for its cracking views of the port. You’ll want to watch the ferry over to neighboring Fuerteventura slipping in and out of the harbor. Lanzarote’s lava mountains, or volcanoes, don’t just provide an epic scenic backdrop, they can also cook your meal for you. At Restaurante del Diablo in Timanfaya National Park, the meat (chicken, rabbit or pork chop) is cooked by the natural heat of a volcano. Plates start at €12. Choose a table along the curved glass window for a view of the staff regularly pouring water into a hole in the ground to produce a near-instant eruption. This is a lunchtime only restaurant, so get there early in the day. Want to eat truly local cuisine? A visit to Orlando and his El Tenique restaurant is a Sunday must-do for many Lanzarote residents. Locals swear by his cabra (goat stew) which is rumored to be the best on the island. Arrive early, when it’s gone it’s gone! If you can’t swing a Sunday, you’ll miss the stew, but the terrace with its volcanic backdrop is still well worth a visit. Ask for the specials, and expect dishes like fried rabbit and veal chop. Where better to work your way through Lanzarote’s restaurants than by enjoying their wine lists? Here, you’ll find a laid back bodega in the heart of the island’s wine country. Surrounded by vineyards, El Chupadero serves whites and reds from the big names (Bermejo, El Grifo). They also offer the lesser-known Reymar blanco seco (dry white), which goes particularly well with the dates wrapped in bacon (€6.50) from their tapas menu. Other top small plate picks include Padrón peppers, garlic prawns and jamon Serrano. Our very top tip is to get here in time for sunset. Enjoy the natural light show over Timanfaya. You’ll soon see why they call these the fire mountains. There’s nowhere better in Lanzarote for properly aged, grilled meats than Grillen. Choose from succulent steaks to spiced ribs that practically fall apart in your hands. The Modern European menu also features fresh fish from the village of La Santa. You can see it from the restaurant. Try the grilled tuna served with Chinese leaf salad. Also, check out the changing specials board. They are open Monday – Saturday. In the heart of an unspoiled fishing village, this no-fuss seaside restaurant serves up fresh fish. It overlooks the lava rock reef and sea between Lanzarote and Fuerteventura. The best bet is to order the parillada de pescado y marisco. It’s a vast tray of seasonal grilled fish and seafood that comes with fried garlic, Canarian potatoes and proper mojo sauces. You know a restaurant is good when it’s perpetually packed. By that measure, Las Cadenas must be outstanding! You’ll need to beat the locals to this one, so arrive before 1.30 pm and settle in for an authentic Canarian lunch. Start with the queso frito. This is local goat cheese they fry in cubes. They serve it with sticky fig jam. It’s aged and cooked to perfection. You will not run out of opportunities for delicious cuisine in Lanzarote. Here you will be able to enjoy local and fresh food, helping you to fully immerse yourself in their culture. It happens to me all the time: I’m traveling somewhere new, and yet all I see around me are McDonald’s and Chili’s. I’m surrounded by national chain restaurants I could patronize at home, when all I want is to sample authentic, local food. Fortunately, I’ve learned a few tricks for finding the food trucks and farm-to-table restaurants I crave. If you want to know where to find local cuisine while traveling (and even when you’re at home), read on! Unless you’re in a foodie haven in which every other restaurant offers farm-to-table, organic fare, it may take effort to seek out local cuisine. At the source: in an agricultural area, seek out fruit or vegetable stands roadside, and ask for recommendations while making a purchase. In wine country, many wineries double as farm-to-table restaurants, and large organic orchards and berry farms often supplement their profit by serving prepared dishes. If you’re visiting a coastal destination, go to the water. You’ll find the freshest seafood vendors and dining right on the docks. Ask at the local fish market for the name of the establishment that buys from them and prepares it best. Just make sure you make sustainable seafood choices. Food trucks are nomadic by nature. You have to know where to go to find that talked-about food truck, and the location can change by the day. Cities often let food trucks use empty lots, parks, and parking lots; you’ll see them trucks circling like so many western wagons. Ask at your hotel or stop a local on the street to find the most popular and well-known food truck gathering places. But if you’re in search of a particular vendor, most cities have sites such as Portland Oregon’s Food Trucks of Portland index, or Boston’s mobile food truck schedule, both of which list food truck vendors and location. Many food trucks notify customers of their locations via Twitter, so there are also plenty of Twitter lists and Twitter accounts dedicated to street food in certain cities. If you do find yourself in the Twin Cities, there are fantastic food trucks there as well as superb sustainable restaurants in Minneapolis – St. Paul. A great way to see the lay of the land, talk to locals, and get to know a destination best is by foot or bicycle. A stroll through a downtown tourist or business district will often yield great food truck and local dining finds. Local store owners and tour operators will be happy to help point you in the direction of their local favorites, too. No need to seek out their brick and mortar locations, either (who has the time?). Google the city name + “twitter” to quickly find appropriate Twitter handles for tourist bureaus and others who will answer all your local cuisine questions. I’ve had luck with tweets such as “Love visiting #Seattle. Within seconds, answers are at my fingertips. Sampling new foods is one my favorite parts of traveling. I love everything from hole-in-the-wall cafes to world-renowned restaurants to sketchy street stands. If you haven’t noticed we have an entire category dedicated to food and restaurants. This week we’re going to focus exclusively on food and travel. More specifically, we’ll be looking at anything that would meet the definition of green food — be it local, natural, or vegetarian. Local food is fresher than food trucked in from other countries. The worst fresh mango in Belize is going to be better than the best grocery store mango in the U.S. 99% of the time. Even if it’s a food that you may not normally eat (like grasshoppers) it’s probably going to be better tasting than the hamburger from the McDonald’s up the road. Because locals need to be able to afford the food, regional specialties will also be affordable for the tourist. Also, when the food doesn’t have to be transported from a far away place, it will cost less. 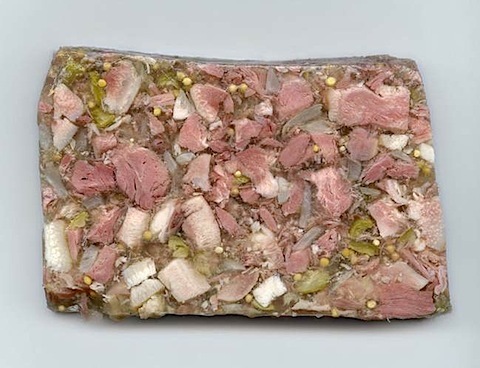 Have you ever eaten head cheese? We ordered it in a small town in the Czech Republic, thinking it was some sort of cheese and not coagulated meat parts. It made for an unforgettable travel experience. Sampling local dishes will give you insight into the culture and history of the area. Do they eat a lot of seafood? Spices? Beef? Even if you don’t read the history section of the guidebook, you can learn a lot just by trying local foods. If you live to be 80 years old and eat 3 meals per day, you’ll eat over 87,000 meals in your lifetime. Most of us are vaguely aware of the impact of food on the environment, but it’s not something we think about every day. Here are five simple ways to reduce your food’s environmental impact. When you go out to eat, choose restaurants that serve sustainable food. Check to see if everything from meats and cheeses to wines and produce come from local sources. Ask locals about their experience with the restaurant, check reviews online, and scour the restaurant’s website for more information. Is the seafood sustainability sourced? Does the restaurant have relationships with local farms and producers? There’s something incredibly satisfying about walking out your back door to pick basil and cherry tomatoes for your homemade bruschetta. Backyard gardening can save you money, too. Organic produce is expensive to buy, but easy enough to grow. And trust me, heirloom tomatoes taste much better when they’re from your garden and cost a fraction of what they would cost at the farmer’s market. Getting started isn’t as intimidating as it sounds. And you can make great Avocado Smoothies as well. Get vegetable starters from a local plant sale. This will require a small up-front investment, but will pay off later. Follow the instructions for planting and caring for your plants. In just a few short weeks or months, you’ll have a garden full of herbs, fruits, and vegetables to munch on. The shorter distance your food has to travel, the better it is for the environment. Plus, you can rest easy knowing that your meat came from a cow that was treated well at a local farm. And your squash will taste much fresher if it didn’t travel 3,000 miles to get to you. Shop at the farmer’s market or co-op to find a selection of delicious, local foods. Take your commitment a step further and go organic and local. Eating organic foods doesn’t have to be an all-or-nothing deal. Some organic food can be quite pricey and it’s fine to buy the organic version of one type of produce and the conventionally grown version of another. Environmental Working Group’s free Shoppers Guide to Pesticides in Produce can help you decide which fruits and veggies you should prioritize and buy organic. If you eat primarily food that’s in season, you’ll significantly reduce your environmental impact. I’m the first to admit that I crave avocados and bananas in January and I think it’s fine to indulge on occasion. But unless you live in Central or South America, that avocado has to make a trip of thousands of miles to get to your plate. Just be aware of your food’s impact on the environment and make educated choices. Farm-to-table restaurants, sustainable seafood, food trucks, organic foods, and sustainable dining guides… it is a lot of consider. However, each of us can lessen our environmental impact if we’re all just a bit more mindful of our eating habits. You will support the local economy and be eating healthier and cleaner too. Are you intrigued by the buzz on locavores? A locavore is someone who eats food that is locally grown and produced. It’s a fairly new lifestyle that is slowly being embraced by millions of people around the world. Being a locavore is not only about being mindful of the food you eat, but also about helping the local community, particularly the farmers. In this article, we take a look at how the locavore lifestyle started, how it evolved, and why people are adapting to it. We also share tips on how you can become a traveling locavore. I’ve been a proponent of eating and shopping locally ever since I began to understand the impact my food, clothes, and everything else I buy has on the environment when it has to travel thousands of miles to get to me. I try to buy my produce at farmer’s markets, do most of my clothes shopping at thrift stores, and dine out at local restaurants. While I wholeheartedly support the concept of being a locavore, I need variety. Try as I might, I’m just not happy eating the same kind of locally-grown apple every day or even wearing my favorite sweater from Goodwill each week. The locavore movement, defined as trying to eat only food grown or harvested within a 100-mile radius of your home, started in San Francisco in 2005 as a challenge for people in the Bay Area. The movement grew quickly and in November of last year, Oxford University Press named “locavore” its word of the year. While it may grow tiresome eating the same foods in just your area, there are infinite possibilities when you learn how to become a traveling locavore. The locavore lifestyle started in 2005, during the celebration of the World Environment Day in San Francisco. Chef and writer Jessica Prentice is credited for coining the word locavore, which first saw print in the San Francisco Chronicle. Prentice was with three other Northern Californian women who were behind a month-long dietary challenge that encouraged people to eat locally. Prentice and her cohorts were the subject of an article that reporter Olivia Wu wrote about eating locally grown foods. Wu asked Prentice to come up with a catchy way of describing people who were into eating locally grown food. In a blog post that she wrote for the Oxford University Press in November 2007, Prentice explained how she came up with the word. She explained that locavore is the combination of two Latin words—locus which means place, and vorare which means to swallow. A few weeks after Wu’s article was published, many websites and organizations started to use the said word. But even before 2005, there have been other people who have previously promoted eating organic food. In the 1970s , the concept of using seasonal and locally grown items was introduced by chef Alice Waters in Berkeley, California with her bistro, Chez Panisse. In 2001, ecologist Gary Paul Nabham published a book titled “Coming Home to Eat: The Pleasures and Politics of Local Foods” which inspired Prentice and her buddies to adapt the practice of eating locally grown foods. Still, it cannot be denied that Prentice’s coining of the word locavore gave the eat-locally-grown-food movement a huge lift as there was now a proper noun to describe the lifestyle. Since 2005, a lot of people have gotten into the bandwagon. In 2014, a Greendex survey conducted by the National Geographic in partnership with research consulting company GLobeScan looked into the food consumption habits and attitude in 19 countries. The survey found that there has been a significant improvement in the eating habits of people. For instance, consumers in South Korea, Australia, Canada and Hungary had higher food scores compared to the results of the previous survey. More interestingly, over 50 percent of consumers in the said countries are now eating locally grown food. The biggest locavores on the planet are the Russians, where 77 percent of the population consumes local food several times a week. They were followed by the Indians and the Chinese. The ‘eat locally grown food’ movement has also become bigger in the United States, a country that is notorious for fast food. A year after the locavore movement was born, farmers’ markets have become fixtures across the country. In 2006, the United States Agriculture Department noted an increase of 50% in the number of such markets with sales reaching $1 billion. Eight years later, the number of farmers markets in the U.S. had increased to more than 8,000 from the nearly 5,000 recorded by the USAD. And the department has credited the increasing public awareness on eating locally grown produce as the main reason for this surge. By now you may be wondering—what are the foods you can eat, and the foods you must avoid if you were to adapt this lifestyle? The common rule among locavores is that anything they eat should have been sourced at least 100 miles from the point of purchase or consumption. So, if you live in Los Angeles, there is absolutely no way you should be eating a lobster from New Orleans, or a cheesecake from New York. Aside from that rule, you can choose whatever food you want to eat. You may even choose to be a vegetarian. There are also no dietary restrictions imposed in locavore diet. Locavores can generally be classified in three general types—ultra strict, wild card, and those who follow the Marco Polo rule. The ultra strict locavores avoid all ingredients that have not been produced or grown locally. On the other hand, those who follow the Marco Polo rule add dried spices into their diet, or food that sailors can carry along while at the sea. The wild card locavores are the most liberal when it comes to their diet. They include ingredients like coffee and sugar into their diet, believing that they can’t live without eating these foods. Locavores usually shop at farmers or green markets. They also join community-supported agriculture outlets to by products directly from the farmers. Becoming a locavore is easy. Now another question that you may be asking is—why do people have to be conscious of where their food comes from? And why should you choose to have a locavore lifestyle? There are many reasons why a lot of people are into eating locally grown foods. One of the main appeals of the locavore lifestyle is that it can assure that the food one is to eat is fresh. Since locavores demand that their foods are grown within 100 miles from where they live, they are certain that whatever they eat is fresh. The taste of the food that is grown locally is a lot better than those which are sourced from other states or countries. Products that are picked and eaten while at the height of their freshness just taste a lot better. And since locally grown products are fresh, one can therefore conclude that these produce are more nutritious. Locally grown foods are guaranteed to be more nutritious than processed foods. Studies have proven that nutritional values dramatically decline as time passes after harvest. Foods imported from far-away countries are older and have sat in distribution stores before arriving at your kitchen for cooking. When you buy from farmers and local growers, you’ll have a better idea on how the food was grown. You can even ask the farmers themselves how they raised and harvested their products. That is something you can’t do when you buy processed food, as you don’t have any idea how the makers raised, harvested, and canned their products. And with the practice of adding preservatives, you just can’t be sure of the purity of processed foods. Locally grown produce not only have the advantages in terms of nutritional value, freshness, and taste. The demand for these products also affects the local economy. When you buy products directly from the farmers, you are contributing to the growth of the local economy. The money you use to buy imported products end up in the coffers of a large company in another state or country. But when you source your foods from a local farmer, the money would be kept within the community. Thus you’re not looking after your health and your loved ones, but you are also contributing to the health of all sectors of the local economy. Supporting locally grown products is also another way to help protect Mother Earth. Locally grown produce use less resource such as paper for packaging and fuel for transporting. And we all know about the global awareness to limit the consumption of paper and fuel. So when there are more people buying from farmers, there is a lesser demand for paper, fuel and other valuable resources. Of course, there are also disadvantages of buying local. Perhaps the most obvious disadvantage is the cost, as organic foods are notorious for being more expensive compared to processed foods. But that is quite a small price to pay when you consider all the good things you’ll get from consuming locally grown produce. Luckily for me, I love to travel. And I can be a locavore by eating foods produced within 100 miles of wherever I am. 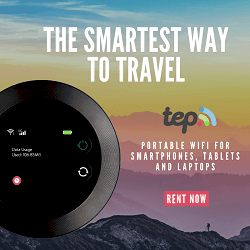 Be it Buenos Aires or Bangkok. As a traveling locavore, you get to visit amazing places, experience exotic cultures, and dine on delectable local food. All while supporting the local economy and making earth-friendly eating choices. When you’re at home (wherever home may be), you have a limited number of different local foods. But when you travel around the world, you’ll discover delicious (and sometimes not-so-delicious) local foods you didn’t even know existed. But can you imagine how more exciting it is to try the products of other states and countries? If you want to embrace the locavore lifestyle but worried about the limited variety of food in your area, you can explore other states and countries by becoming a traveling locavore. Becoming a traveling locavore has its benefits. One is that you will get to visit amazing places. You’ll also get immersed in the cultures of the countries that you are visiting. And think of all the delectable local food that you can try. A more noteworthy benefit is that being a traveling locavore enables you to support the local economy. There are a lot of places that you can explore, and manu foods to enjoy when you become a traveling locavore. The Internet is the best way to research on the foods that you can buy and cook when you are visiting a certain area. Look for nearby farmers markets in the place that you are staying. Then visit these markets and shop for locally grown produce that intrigue you. Since you would have to cook the foods that you purchased, it’s only practical that you stay in a place where there are cooking facilities. It also helps to be friendly with the locals, so you can ask them where farmer markets are situated. If you intend to keep your visit within the North American region, you can check out websites like eatwellguide.org where you can see a listing of markets, farms, and restaurants that serve local food. If you are heading to Canada, visit the website www.greeneggstoronto.ca which hosts a database of local foods in Ontario. You can also enjoy locally grown produce when you dine in at locavore restaurants. You would be surprised at the increasing number of locavore restaurants worldwide. A quick Google search should give you an idea on the restaurants you must visit if you want to take a sampling of local foods. You can also check out the reviews on the locavore restaurants that you are interested in visiting. Websites like Trip Advisor, Yelp, and even Facebook allow anyone to write reviews on establishments such as locavore restaurants. By reading customers reviews, you will have an idea on which meals to order, and how much you are likely to spend. You may even ask your travel agency or tour guide if they know any restaurant that serves only locally grown foods, or if they are familiar with any farmers market in the area that you are visiting. If you’re the techie type, you can use your iPhone to find a locavore restaurant in the place that you are in. There’s the Locavore app that helps you find organic foods near your area. It also supplies you with daily updates on your favorite vegetables, fruits meats, and dairy, as well as tips on how to cook them. In case you’re in another state, check out the Farmers Market Finder that instructs you how to go to the nearest farmers market and locavore suppliers in at least 10 states. And when you are shopping for fruits and vegetables, it pays to have the Harvest app. This is a reference app that teaches you how pick the freshest and most delicious fruits and vegetables. As you can see, becoming a traveling locavore is easier as you think it is. There are lots of farmers markets that you can go to in the United States as well as in other parts of the world. The number of locavore restaurants is also increasing. And there are several apps that you can install on your smartphone and tablets that can help you find a locavore restaurant or farmers market. With all these things going for you, there’s really no reason for you not to become a traveling locavore. Becoming a traveling locavore you prioritize your food in the same way, but have the added benefit of experimenting with produce, meat, and dairy products native to the region you’re visiting. Wow Its a Good information for travelers.All five resorts gives all possible facilities and food.Thanx for telling about these resorts. Thanks for stopping by! Sustainable food is important to us when we travel. 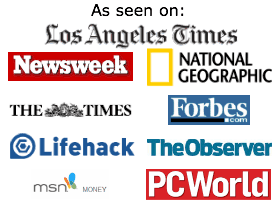 I just wanted to thank you again for submitting your article to the Byteful Travel Blog Carnival. It’s been included in the 16th BT Blog Carnival which was published today. Thanks for including us, Shanna!